The Philadelphia Union have announced that defender Fabinho, midfielder Warren Creavalle, and forward Kacper Przybylko will be returning for the 2019 MLS season. Przybylko and Fabinho had previously had team options on their contract declined, meaning this new contract represents a new agreement, and likely different compensation numbers. Creavalle was out of contract. While Fabinho and Creavalle can be expected to provide depth and leadership in their respective positions, it’s still not clear where Przybylko fits in the Union’s plan. 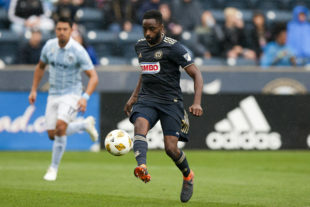 Nominally a striker, the Pole has made no appearances for the Union or Bethlehem Steel FC since signing with Philadelphia in September of this year. I’m not loving the Creavalle signing. I’d rather Jones get all the minutes that Creavalle might get. Tanner has been able to observe what we don’t have the opportunity to see. Objective as I can be, I think Warren played well in 2018 when called upon. So I’m fine with this, especially since it was a completely new contract. Jones gotta lock those up before we throw away a saftey valve. Think about the tactical implications of “transition” aka counter-attacking at speed, especially defending when the charge of the Royal Scots Greys — Waterloo — loses the ball. That’s not Haris Medunjanin’s game defending being countered. That’s much more Jones’s. Creavalle is a great signing. We need a D mid and I’m fine with having him and Jones as D mids. Hopefully they will be used a lot more this upcoming season both starting in and out. One of the problems last year was that we didn’t have any D mids starting. Creavalle’s first touch is so bad that his second is a tackle ! Why resign him? Play Jones. How does signing aging backup players from 2018s mid table side improve 2019s team? Ernst is really putting together a squad. I wonder whom they outbid to keep that trio?